Traditional, slightly curved shape. For many it is the shape of a real boomerang. 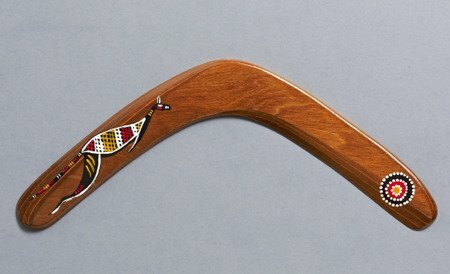 It is so, because in the past boomerangs were made out of branches of trees, which were by nature bent in a similar shape. It is smaller than our Banan XL boomerang, thus requires less power for proper throw. It has less stable flight than Banan XL, but it is irrelevant with light wind. The flight path in an oval shape, with a raising at the maximum distance from the thrower. 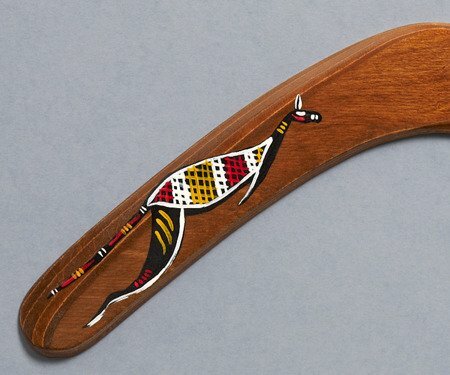 Hand made boomerang, decorated in handmade ethnic painting. It shows Eastern grey kangaroo (Macropus giganteus) in the so-called "X-ray" painting. For an additional fee, the boomerang can be personalized by adding an occasional inscription, but then the delivery time will be extended. Please ask for details.